1. Eye: Simply stated, this is the ringed loop at the front end of the hook where the tippet or fishing line is attached. In fly hooks, eyes can be positioned at different angles to the shank either up, down or straight. The various angles apply different directions of leverage as it relates to the line pulling on the hook at the time of the hook set. Eyes are also available in larger than normal sizes for ease of tying on the tippet to very small hooks. Eyes also come in various designs including ball, tapered, looped, needle, brazed and flattened. 2. Shank: This it the straight portion of the hook wire that starts at the bend and runs to the eye. It can come in various lengths either short or long to standard sizes. It also is available in straight or curved variations to accommodate different fly designs. For example; nymph hooks are often slightly curved; egg hooks are often radically curved; dry fly and streamer hooks are mostly straight. 3. Bend: The bend of the hook begins at the curve from the end of the shank and runs all the way to the point. Hook bends come in different shapes or curves in order to generate different angles of pressure while in the act of setting. There is also different geometry that is used to create greater holding power once the hook is set. One of the most important components of the hook bend is the length of the gap. Theoretically the greater the gap length the easier the hook sets into the fish. For fly hooks, curve designs come in various classis styles and new and different more radical shapes for specific purposes. Bends can vary greatly by manufacturer and intended design and as such should be considered when first designing a new fly pattern. 4. Throat: Also called bite, this is the distance from the apex of the bend to the line of the gap that runs at a right angle from the shank to the tip of the hook point. This measurement is important because it is the portion of the hook that becomes embedded in the fish and is directly related to holding power. Theoretically, the longer the throat of the hook is the greater the penetration thereby creating more holding power. Throat lengths vary greatly in different hook designs and can be affected substantially by the shape of the bend and the length of the point. 5. Barb: This is the projection of the point that extends backwards in order to hold the hook firmly in the fishes mouth. The bard limits reverse motion so that the hook point remains embedded. 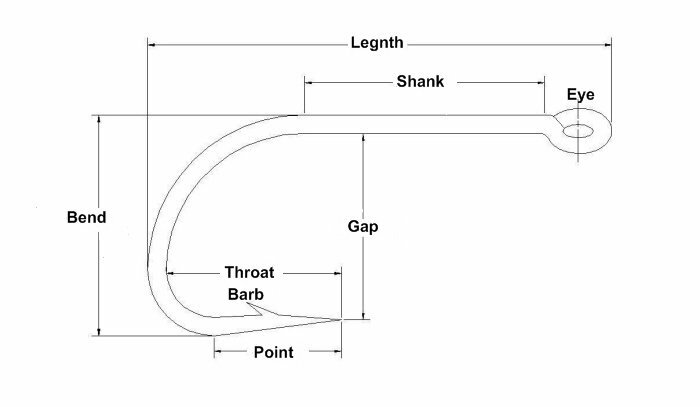 Barb designs vary in height and length most of which is designed to limit harm to the fish. There are many barbless designs that are available to fly tiers and can be found in almost any style of hook. 6. Point: The point of the hook is the sharpened end that penetrates the mouth of the fish first. Long and thin at the tip it is the single most important part of the entire hook. Much time and effort is extended by manufacturers to develop point designs that are sharp and strong. Hook points come in different designs including needle, hollow ground, spear, arrow, knife and of course barbless. Many are chemically sharpened in the manufacturing process today creating truly sharp and strong points that stay that way. 7. Gap: Also called gape, this is the distance from the hook shank to the point. It is important to the hook setting process as it positions the hook point inside the mouth of the fish. The longer the gap the deeper the hook point will be in side the mouth of the fish thus creating a greater chance for the hook to set. Gap varies by hook bend design and must work in conjunction with shank length to create the most effective setting angle between the hook eye and the point at the time of the set. This angle created from the hook point to the eye is called “effective shank length” and creates leverage that is responsible for setting the hook point. The greater the distance from the point of the hook to the hook eye the greater the leverage and the better the chance of setting the hook. 8. Length: Also called overall length, this is the distance measured from the outboard surface of the hook eye to the outboard surface of the apex of the hook bend. Many hook manufacturers have gone to using metric units of measure to express overall length.